Not only is this easy to cast, it also attacks nicely and really benefits from mentoring. Boros decks need 2-drops to survive, and this is one of the better ones. 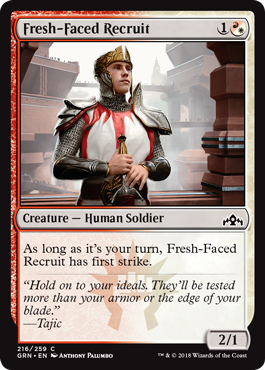 I also like that it only has first strike on your turn—that’s a marked improvement to having it always, as it doesn’t gum up the ground or make attacks too difficult for the opponent. In fact, I could see a new keyword that does just that playing quite well.